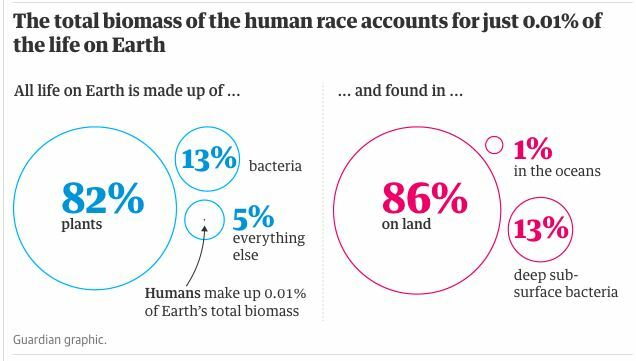 A new study has revealed the astonishing impact of humans on the planet, despite our relative insignificance in biomass. While the study calculates that world’s 7.6 billion people represent just 0.01 per cent of all life on earth, our actions are estimated to have caused the loss of 83 per cent of all wild mammals and half of the world’s plants since the dawn of civilisation. Our far-reaching impact has led many scientists to call for the declaration of a new era, the Anthropocene, to replace the Holocene. Many academics now believe we have already entered a sixth mass extinction of life in the Earth’s history. About half of the Earth’s animals are thought to have been lost over the past 50 years, with the destruction of natural habitats for farming, logging, development and general human consumption almost solely to blame. The study found that bacteria form 13 per cent of all living matter, but this was far out-shadowed by plants which represent 82 per cent of all life on Earth. Everything else, including all animals, is accounted for by the remaining 5 per cent. 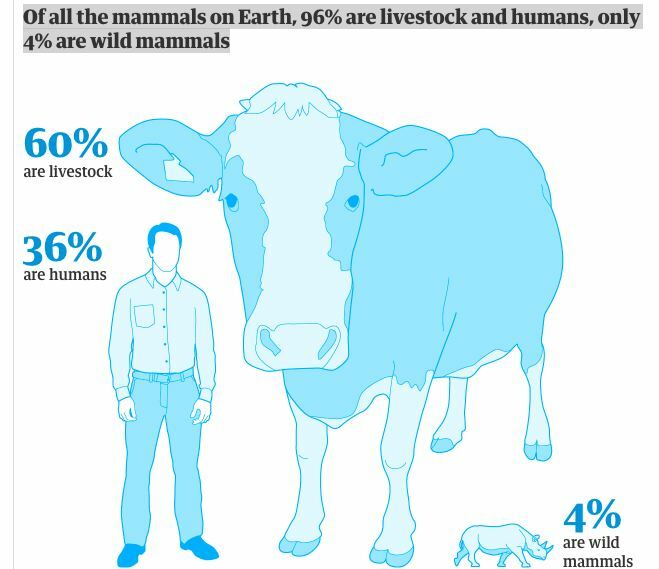 Other shocking statistics included the fact that 96 per cent of mammals on the planet were either livestock (60 per cent) or humans (36 per cent), with wild mammals accounting for just 4 per cent. Similarly, 70 per cent of the world’s birds were chickens or other poultry. 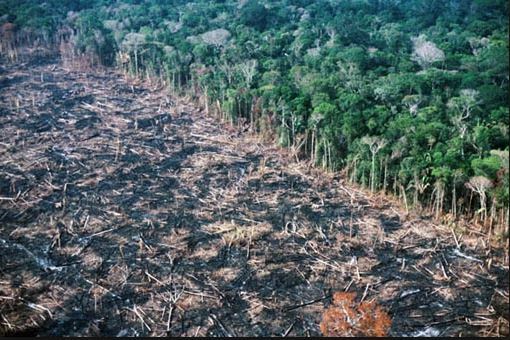 Despite our impact, humans’ total biomass is relatively tiny. For example, fungi accounts for 200 times more biomass on the planet than us, while there are 12 times more fish and three times more worms.